Hello, my readers here I am with you a beautiful strawberry dessert called strawberry mousse. A mousse (French 'foam' /ˈmuːs/) is a soft prepared food that incorporates air bubbles to give it a light and airy texture. It can range from light and fluffy to creamy and thick, depending on preparation techniques. 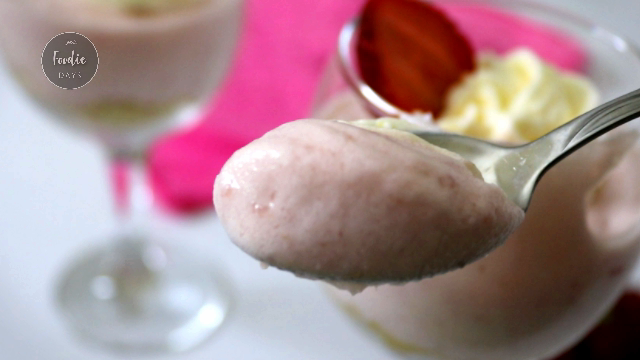 A mousse may be sweet or savoury. Sweet mousses are typically made with whipped egg whites, whipped cream, or both, and flavoured with one or more of chocolate, coffee, caramel pureed fruits, or various herbs and spices, such as mint or vanilla. In the case of some chocolate mousses, egg yolks are often stirred into melted chocolate to give the final product a richer mouthfeel. 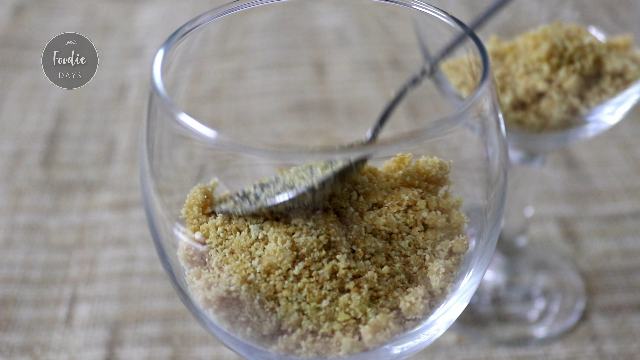 Mousses are also typically chilled before being served, which gives them a denser texture. Sweetened mousse is served as a dessert, or used as an airy cake filling. It is sometimes stabilized with gelatin. Here I used china grass which is the vegetarian version of gelatin to stabilise the mousse. Marie biscuits - 6 numbers. Chinagrass(3 gms)1/4 cup china grass strands. Take Marie biscuits in a mixer jar or food processor jar. Crush them into a fine powder. Transfer to a small bowl and mix it with softened or melted butter. Spread it at the base of the mousse in the serving cups equally. Press it gently with the back of a spoon. Refrigerate this until the strawberry layer is done. 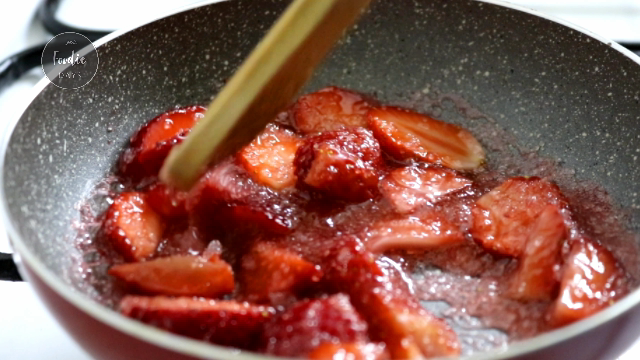 Chop the strawberries into small pieces and set aside. Heat a pan with 1/2 cup of water and add china grass. Boil the water till the china grass melts completely. Strain this mixture and keep it aside. 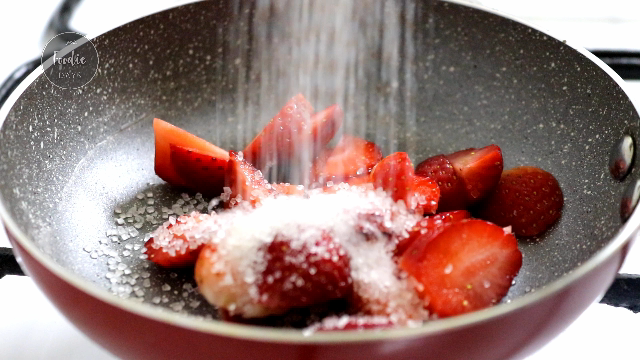 Now cook strawberries along with sugar until the sugar melts completely. 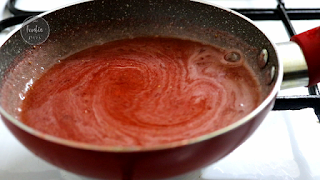 Puree this mixture and pour back to the same pan. Add prepared china grass mixture and heat this mixture together in a low flame. Strain this strawberry china grass mixture and let it cool completely. Gently whisk with a fork if it starts to set. Do not allow to set completely. Chill a large bowl and whisk attachment for 10 minutes in the freezer. Add cold milk, whip cream powder and beat for 2 minutes on high speed. Add strawberry or vanilla essence and beat until light and fluffy or until soft peaks form. Add 3/4 of the whipped cream to strawberry china grass mixture. 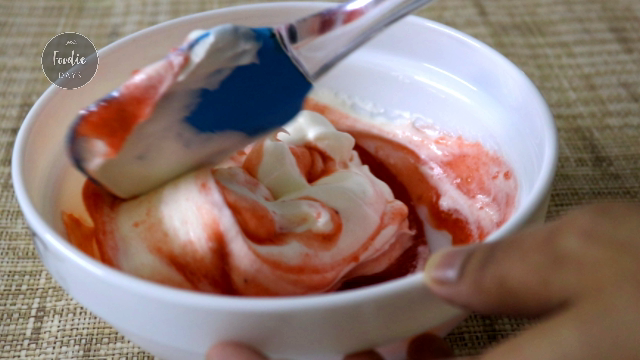 Gently fold the whipped cream into the strawberry mixture. Pour it over the biscuit base of the cups equally. Cover it with a cling wrap and chill the mousse to set for at least 2 hours. Fill the remaining whipped cream to a piping bag with a star tip nozzle. 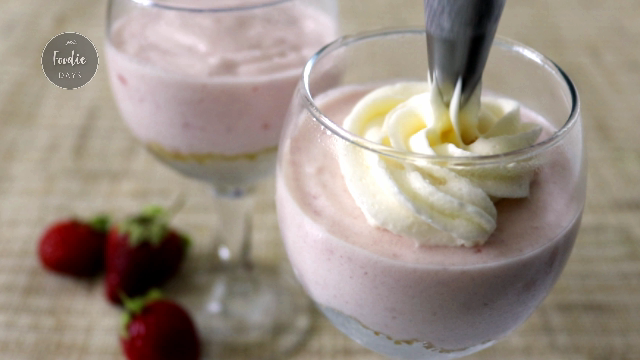 Pipe it above the chilled mousse along with fresh strawberry and enjoy..
Only professionals can do it in right way. You have done it excellently. Your article talks your talent. I really loved the post you have shared. The contents have good structure with necessary data. I came to your blog which is having good quality, perfectly organized and well-written posts. An article is always a detailed explanation of a topic. I work with panseva as an executive. In my weekends I follow your recipes.